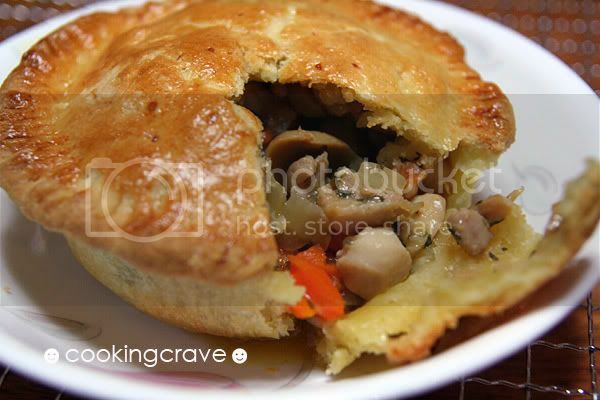 The chicken pie made by Fad Mom really makes me salivating, you can view it HERE ~ I love savoury pastry. Immediately, it drives me to DIY my own version of chicken pie as well. Recently I'm really into pastry making, it's really easy to prepare and the results never upsets me ☻ I always believe the recipe shared by Fad Mom, she just got the same taste buds as me and I just proceed with the DIY pastry recipe she use from Baking Mum. Ya, her recipe is SUPER EASY. I got the pie dough ready in less than 15mins and put it in the fridge before I started to work on the pie's filling. As for the pie's filling I've followed Fad Mom using the chicken thigh's meat as it'll be more tender and delicious but I marinate & cook it my own way. You may marinate the chicken according to your preferred seasoning - it is flexible. I prefer the dry version of filling and using less ingredient on it. Simple is just as nice !! "Look at those chicken pies" ~☻ It doesn't look like my work at all...hahaha!!! Yay, my kids offered to help me fill the pie filling and do the pattern on it. They are just creative right??? What you need for the pastry??? Put all the ingredients into the mixing bowl except yoghurt, and mix to a crumble. Add in yoghurt and mix to a dough. Dough will be very soft, so need to keep it refrigerated for at least 30 mins. Heat a non-stick pan with olive oil. Saute diced onion till it's fragrant and soft. Add the diced carrots and continue cook for a while. Stir in the chicken continue to cook till it's juices are sealed and in medium heat. I didn't add water because the onion, carrot and chicken will produce water when we cook them. Taste the chicken and see if it's up to your preferred taste. 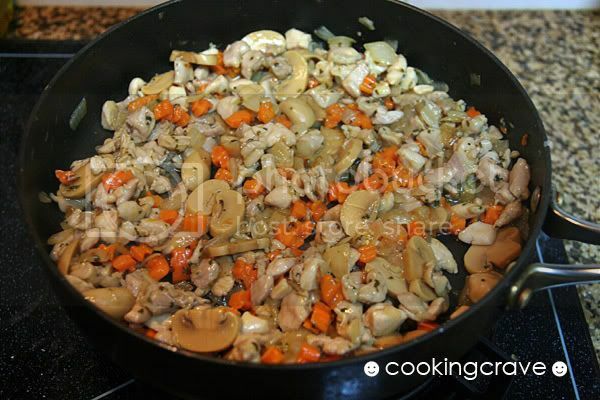 Add in mushroom slices, stir to mix with the chicken. By this time, it'll be a bit dry. Pour in the cornflour mixture and give it a quick stir to thicken it. Voila~ the pie filling are ready. Okay, the FUN part of making pie. All my kids offer themselves want to help me with this. It's just like another clay shaping session for them. 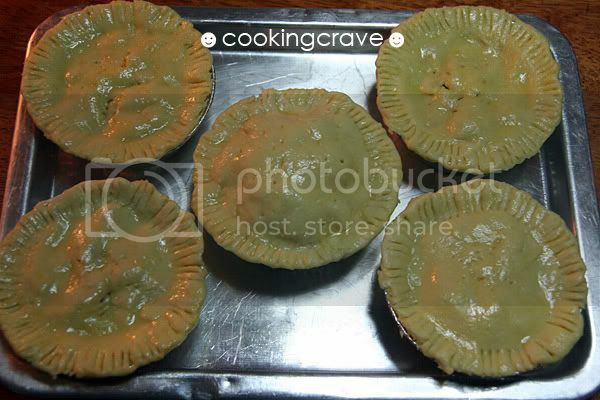 The recipes above yield 5 pies of 4"/10cm mini mould I use. Roll the pie dough on the floured marble surface about 1/4cm thick, as long as it won't tear when we lift them up. Line it in the mould with extra hanging out. Slightly press lightly to the shape of the mould used. Cut the excess dough with scissor followed the shape of the mould. Fill in the pie fillings. Cover it with another rolled dough on top and cut the excessive dough follow the shape of the mould. Press the edges of pie with the back of fork to stick them together and on top of the pie, make some holes using the fork. This is to let the steam released when we bake it. 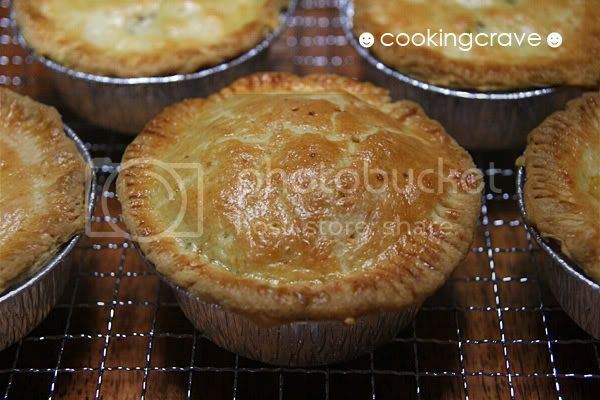 Glaze the pie with beaten egg and baked it at 180c for 35~40mins or when the pie turns brown, it's done. OMG!!! Look so so so delicious wor! U so GENG leh, so good in baking wer! Love the 1st photo! It sure did triggered my saliva glands! Now I have to look for some chicken pie to feed my stomach & brain! Hope I can find some that looks as good as yours! Good job! 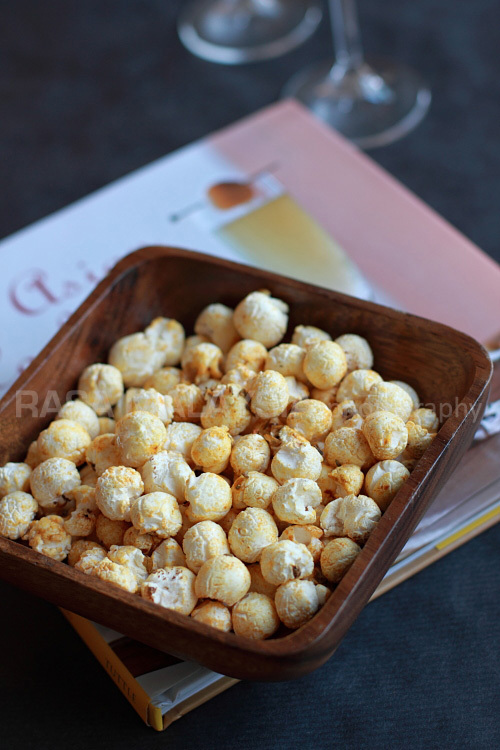 Patrica: Thanks for drop by:D Ya, you should try to make one. Bigfish: Thank u. I'm still in learning stage. Colin: Thanks, I'm still learning how to make my food looks great thru the lens. Lighting are important. I should get a table lamp for that. fortunately you have 3 lovely kids to "sapu" your cooking, that feels really nice and satisfied, right? Motivate you to cook more! LOL!! Wow great pies. Would like to try them up soon.